The collapse of climate legislation last week is in part due to the ineffective mass communication of climate science. Washington D.C. is ablaze with “Monday Morning Quarterbacking” on literally this Monday morning (I’m in D.C.), but at the core of it all is a toxic mix of poor communication and failed leadership. It’s now official — this country is in the grips of a full blown science communication crisis. 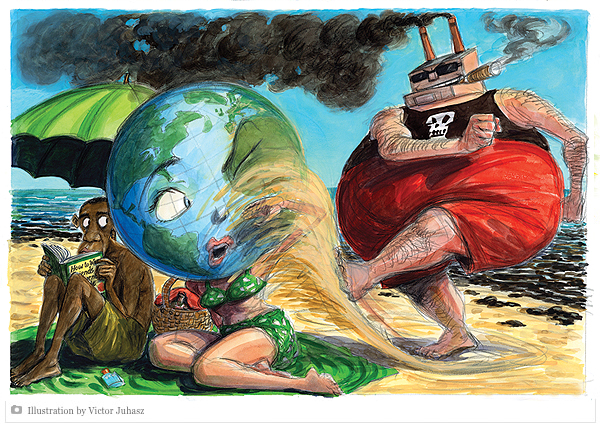 BIG BUSINESS MAKES A MOCKERY OF CLIMATE SCIENCE. Rolling Stone (the magazine that recently engaged in "assisted career suicide" with General McChrystal) has apparently decided to make itself culturally relevant again. In this month's issue they point a fickle finger at President Obama for his failure to push forward a climate agenda. This illustration comes from their article. Last week Senator Harry Reid announced that the only major piece of climate legislation in Congress is officially dead. Rolling Stone points to the Obama Administration in doling out blame — which is particularly painful given what would have seemed like a prime opportunity to springboard something off the BP disaster. For the science world, the official crisis is that the best scientists this nation has to offer are trying to tell the public that excess carbon emission is a serious problem that needs to be addressed. But their message is not coming through. THAT IS A SCIENCE COMMUNICATIONS CRISIS. It doesn’t get any more cut and dried. On Friday I took part in a conference call on this subject with a team from The Nature Conservancy who will transcribe the call and eventually publish it in their monthly science publication, Science Chronicles. This week I’m in Washington D.C. to meet with folks at the Union of Concerned Scientists and Center for American Progress to talk about the mass communication of climate issues. And in the meanwhile, we have THE ONE BIG STORY THAT IS NOT BEING TOLD: That the predictions of the Intergovernmental Panel on Climate Change (IPCC), which climate skeptics have repeatedly labeled as being, “alarmist,” are now consistently being EXCEEDED. Things are getting worse MORE RAPIDLY than expected. You would think, given the outdoor sauna that places like Washington D.C. currently are experiencing (the misery index is through the roof here! ), that EVERYONE would be talking about global warming, but as yet that’s not happening. I think there’s a lag factor at work for the present. But wait til late August if it stays like this. UPDATE: It’s Monday morning in D.C. and the landscape is cluttered with downed trees from yesterday’s violent thunderstorms, and OpEd’s from last week’s climate collapse. Perhaps the most prominent is Paul Krugman in the NY Times who says the climate effort didn’t fail because of a lack of science or because of the weak economy. He points the finger of blame at GREED (meaning the coal and gas companies with their powerful disinformation campaign) and COWARDICE (politicians who have given up the fight, with John McCain as his biggest target, labeling him a “climate coward”). Similarly, Lee Wasserman in the NY Times blames not just the politicians, but the Obama Administration in general. He concludes his editorial by saying, “Citizens wouldn’t support an approach they couldn’t understand to solve a problem our leaders refused to acknowledge.” He couldn’t have said it more clearly — we have a failure of both communication and leadership.